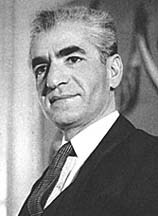 Mohammad Reza Shah Pahlavi, King of Kings, Light of the Aryans and Grand Ayatollah Imam Khomeini, Leader of the Islamic Revolution and Founder of the Islamic Republic... two men who have shaped our lives, more than any other politician in the past half century, in the most contradictory fashion... and yet despite their wide and obvious differences, they had a couple of things in common: neither was very good at displaying compassion or accepting compromise. It was either their way, or no way. A couple of months ago I visited my relatives in Los Angeles. They brought out several books of collected photographs. "I've seen that... that too... not interested... Wait! What's that?" It was a book called "Coronation in Tehran" (Special edition of "Bunte Illustrierte", West Germany, 1968 ? ; photographs by various photographers), with dozens of pictures of the Shah, his family and... many of them from his coronation in October 1967. I thought why not select a few pictures from the book and put them side by side pictures of Ayatollah Khomeini published in "Allah-o-Akbar" (Culture and Art Foundation of Iran, 1980 ? ; all photographs by "Hatami").